Pilgrim, as you enter the cathedral let go of the “tourist” intention of understanding everything (!) and embrace the pilgrim intention of making a significant and meaningful connection with God. 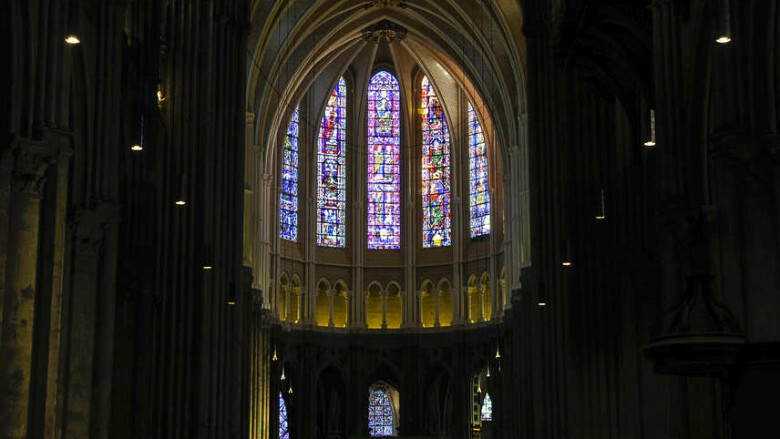 One of the most helpful things that I heard when I first came to Chartres cathedral was, “pass by that which you do not love.” There is so much to see at Chartres. So much to learn! So much to explore! So much… Sometimes in the face of “so much”, the tendency is to withdraw. Or, to learn everything without taking in anything. You are about to enter a universe. It is impossible to fully grasp any universe in 45 minutes—or a day—or a week—or a lifetime. As you prepare to enter the cathedral it is helpful to embrace a sense of humility and openness. Upon entering the cathedral, find a place where you can stand to take it in. Allow your eyes to adjust to the environment. Pay attention to what you are feeling, sensing, seeing, and hearing. Look down. What do you notice? Can you get a sense of the floor below you? Look around: Look to your right and take in the south side of the cathedral. Look to your left gazing at the windows, architecture, people and anything else you see. Look up. What do you see? How does it make you feel? Look inside. What is like for you here? You may “see” this best with your eyes closed! If you wish to get a sense of cathedral, walk around it slowly. It may help you to think of taking this walk with the risen Christ. You can always ask, “Why have You invited me here?” The answer(s) may come in surprising ways! Notice everything that draws your attention, but for now don’t stop. without focusing on any of them. Tell yourself that you will have time to return. Pay attention when something seems interesting or when you feel repelled or horrified. Don’t linger, you are simply collecting impressions, not analyzing or exploring them in any way. It might help to remember that whatever reaction you are having is about you, much more than it is about the cathedral. While you explore, be aware of the sensations you experience. What are you feeling physically in this space? Tune in, this is an embodied experience. The view of the front of the cathedral from the back. The crossing of the nave and the transepts. The modern altar by Gudji, a deep symbol of God’s love. The rose window in the north. The rose window in the south. The chapel with Notre Dame du Pilier (just to the left of crossing in the north ambulatory. 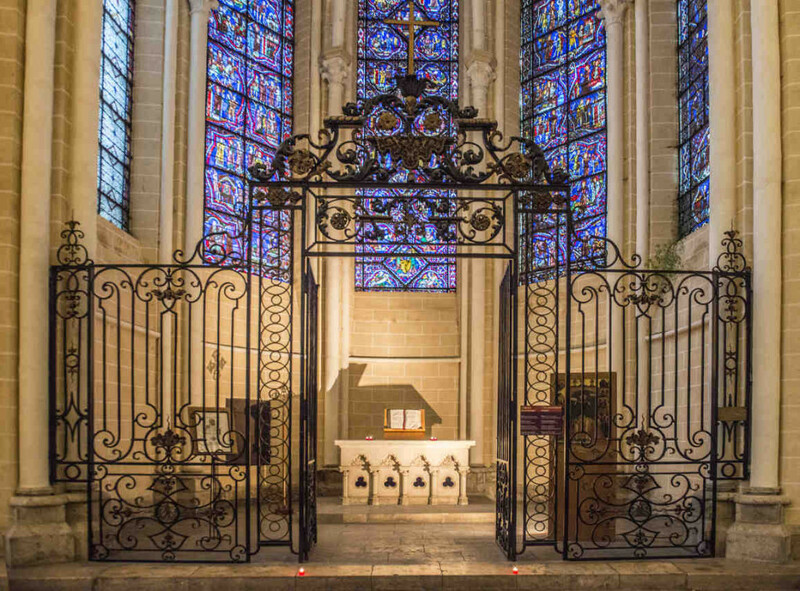 The chapel with the cathedral relic, the Veil of Mary in the north ambulatory..
Notre Dame de la Belle Verrière (Our Lady of the Beautiful Window) in the south ambulatory. Once you have a sense of where you would like to return, go there and stay for at least 10 minutes. Get a sense of what is there, how you feel in that space, and what prayers are emerging in your mind and heart.